Vær sikker på at få en god pris på Hostal Mamatierra - vurderet til 8,9 af andre gæster. Comfortable hostel with very nice staff preparing the breakfast in the morning. It is less than 5 mins to the bus station. Great kitchen, a wonderful staff and good breakfast. Our double room (ensuite) was really spacious, comfortable and clean. Staff was friendly and helpful. Breakfast was very good. The hostel is located a short walking distance from the main street, very convenient. Highly recommend it! Really nice hostel, very clean shared showers and toilet with everything you need - shampoo, shower gel. Very helpful staff who can book all the tours for you. My luggage was lost and they called the company for me and sorted it out. Delicious breakfast with cooked pancakes and eggs. They even prepare a snack for you if you are leaving before breakfast time. Nice hotel located in a quiet area of San Pedro yet close to the main street and bar/restaurants. The staff was always very helpful, breakfast exceeded my expectations for a hostel and they have free mineral water available all day long where you can refill your water bottles - sustainable and essential in a hot dry place at such high altitude as San Pedro. I totally recommend it. Although location was not very close to Caracoles, it was very easy and fast to reach the center by walking. But the hostel is amazing, very clean (bathrooms, rooms, kitchen), the staff was always up to help. Wonderful breakfast, drinking water available. Given the high prices in San Pedro, the hostal was with $50 cheap. It was clean and the bed and breakfast was OK. The staff was helpfull, although charging 32.000 pesos for the moon valley trip which costs 12.000 if drectly booked shws the Chilean go too far. Staff were very helpful, easy to book tours, great breakfast, good wifi most of the time. Very friendly staff, very clean facilities, absolutely recommended! "Comfortable hostel with very nice staff preparing the breakfast in the morning. It is less than 5 mins to the bus station." "Great kitchen, a wonderful staff and good breakfast." "Our double room (ensuite) was really spacious, comfortable and clean. Staff was friendly and helpful. Breakfast was very good. " 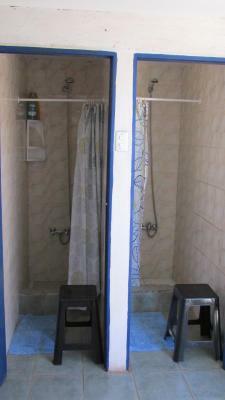 "Really nice hostel, very clean shared showers and toilet with everything you need - shampoo, shower gel. Very helpful staff who can book all the tours for you. " "Nice hotel located in a quiet area of San Pedro yet close to the main street and bar/restaurants. " "Excellent facilities and kitchen. Best shower in chile so far - powerful and strong! " "Although location was not very close to Caracoles, it was very easy and fast to reach the center by walking. " 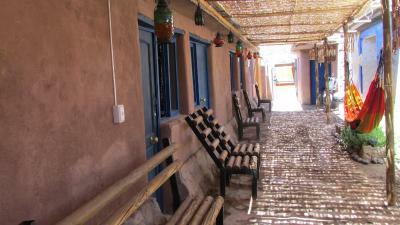 "Given the high prices in San Pedro, the hostal was with $50 cheap. It was clean and the bed and breakfast was OK. "
"Staff were very helpful, easy to book tours, great breakfast, good wifi most of the time." "Very friendly staff, very clean facilities, absolutely recommended!" 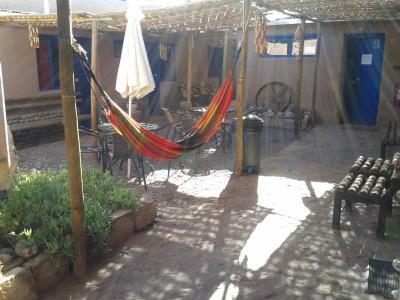 Set in a rustic-style house only a 10-minute walk from San Pedro Church, Hostal Mamatierra offers rooms with free Wi-Fi in San Pedro de Atacama. Breakfast is provided and common kitchen facilities are featured. 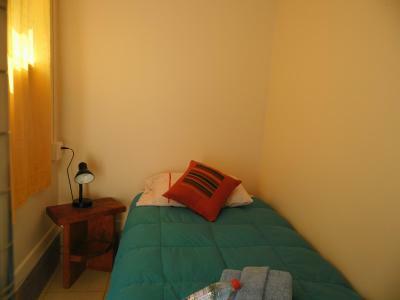 Rooms at Mamatierra are decorated with lively-coloured bedspreads. Some rooms have private bathrooms with showers. A buffet breakfast is served daily. Guests can prepare their meals in the common kitchen facilities. The cheapest market in town is next door. Hammocks are available on the terrace, for guests to relax. 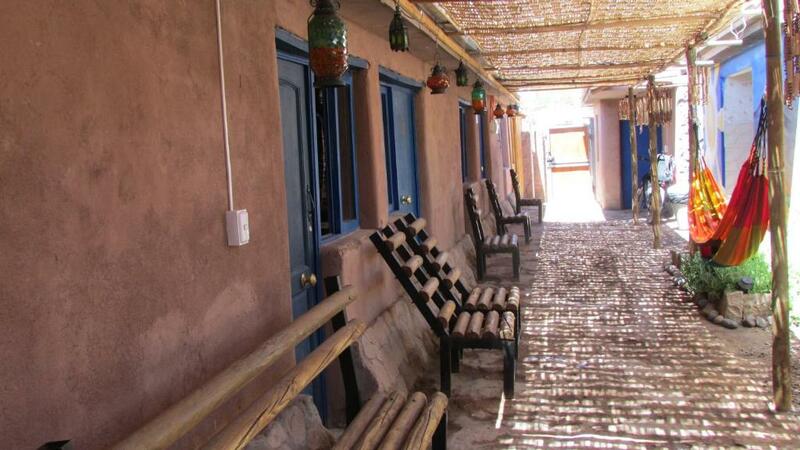 Hostal Mamatierra is 157 km from the Argentinian border and 100 km from El Loa Airport in Calama. Ifølge vores gæsters uafhængige anmeldelser er dette deres yndlingsdel af San Pedro de Atacama. Dette overnatningssted har fået en god karakter for "Valuta for pengene" i San Pedro de Atacama! Gæsterne får mere for pengene i forhold til andre overnatningssteder i byen. Hostal Mamatierra har budt gæster fra Booking.com velkommen siden d. 17. apr. 2012. Hvornår ønsker du indkvartering på Hostal Mamatierra? This room features 2 bunk beds and a single bed. Breakfast is included. This triple room has a single bed and a bunk bed. It features a shared bathroom. Før du booker Hostal Mamatierra tager imod forespørgsler! Angiv dit ønske i næste trin. Hostal Mamatierra tager imod disse kort og forbeholder sig retten til midlertidigt at reservere et beløb på dit kreditkort forud for ankomsten. This fee is not automatically calculated in the total costs for the reservation. Please note that the property will only accept dollar bills in good condition. "Great kitchen, a wonderful staff and good breakfast. " "Our double room (ensuite) was really spacious, comfortable and clean. Staff was friendly and helpful. Breakfast was very good. The hostel is located a short walking distance from the main street, very convenient. Highly recommend it!" 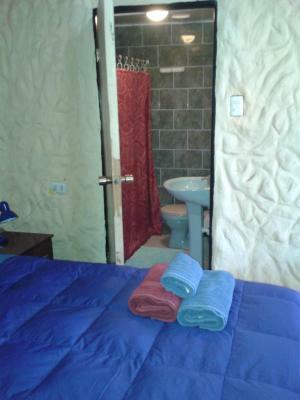 "Really nice hostel, very clean shared showers and toilet with everything you need - shampoo, shower gel. Very helpful staff who can book all the tours for you. My luggage was lost and they called the company for me and sorted it out. Delicious breakfast with cooked pancakes and eggs. They even prepare a snack for you if you are leaving before breakfast time." "Nice hotel located in a quiet area of San Pedro yet close to the main street and bar/restaurants. The staff was always very helpful, breakfast exceeded my expectations for a hostel and they have free mineral water available all day long where you can refill your water bottles - sustainable and essential in a hot dry place at such high altitude as San Pedro. I totally recommend it." "Excellent facilities and kitchen. Best shower in chile so far - powerful and strong! Breakfast included however as we had the salt flats tour early they make a pack up breakfast to take with you Warm and comfy bed, highly recommend "
"Although location was not very close to Caracoles, it was very easy and fast to reach the center by walking. But the hostel is amazing, very clean (bathrooms, rooms, kitchen), the staff was always up to help. Wonderful breakfast, drinking water available." "Given the high prices in San Pedro, the hostal was with $50 cheap. It was clean and the bed and breakfast was OK. The staff was helpfull, although charging 32.000 pesos for the moon valley trip which costs 12.000 if drectly booked shws the Chilean go too far."